Antonia Perez is a mixed media artist born and raised primarily in New York City, who attended the High School of Music and Art (now known as the La Guardia School of the Arts), where Raphael Montañez Ortiz was occasionally her substitute painting teacher. She briefly studied painting and printmaking at San Carlos, Escuela Nacional de Pintura y Escultura and then at Vancouver School of Art. In her twenties she worked with mural artists at El Centro Cultural de la Raza in San Diego, CA and has painted a number of murals collaboratively and individually. 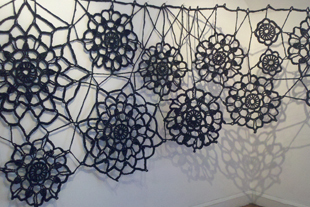 She is mostly known for her sculptures and installations made from crocheted grocery bags. In 2013 she was selected as a Smack Mellon Hot Pick. 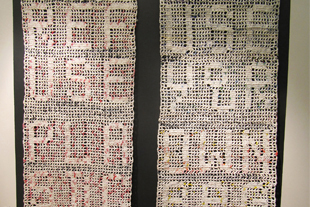 She is the recipient of a 2011 Marie Walsh Sharpe Space Program Award and has had residencies at the Art Center, Rosenthal Library, Queens College and at Soaring Gardens, PA. She has exhibited locally and nationally, including in the Queens International, Queens Museum; the S-Files, the 2011 Biennial of El Museo del Barrio; Praxis International Chelsea, EFA Project Space, Parallel Art Space, and Storefront Bushwick. 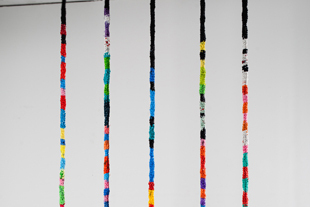 Most recently, her work was included in Women Choose Women Again at the Visual Arts Center of New Jersey, commemorating the 40th anniversary of Women Choose Women, an exhibition that marked the inception of the movement to exhibit the work of artists who are women. Perez received her Masters of Fine Arts from the City University of New York, Queens College in 2010. “Much of my work has evolved from my practice of collecting discarded objects such as used plastic bags, household linens, tissue boxes and assorted detritus from the home or market that has the potential for conversion to something unexpected. 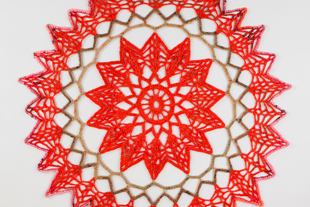 Needlework, as a form of making and as a reference for imagery, is central to my practice. I am interested in the labor and the laborers associated with quotidian life and the discards and remainders that evidence the history of that life. Dishtowels stained and torn with use, a curtain faded from the sun or a colorful grocery bag brought home from shopping and thrown out, produce bags and baskets, old embroideries, weavings and crocheted items are all treasures to me. For more information, please visit www.antoniaaperezstudio.com. For a conversation between Nicolás Dumit Estévez and Antonia Pérez, click here.